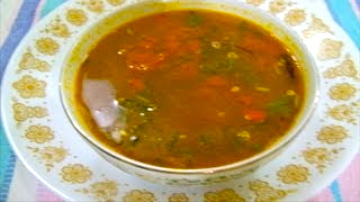 Pappu Charu or Pappu pulusu is an easy recipe for every day cooking. Kids enjoy Pappu charu very much. Not only kids, the whole family will like it. 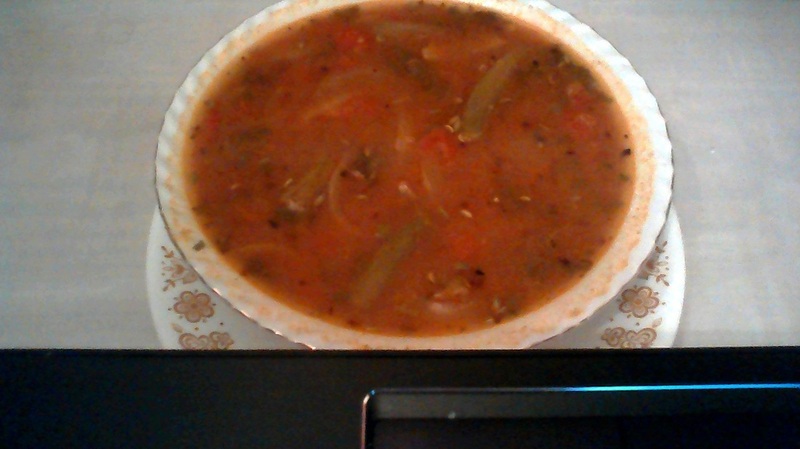 Try this Andhra style pappu charu and give me your feed back. Don't forget to make potato fry or potato curry along with pappu pulusu which makes a good combination. a handful of cilantro r coriander leaves. 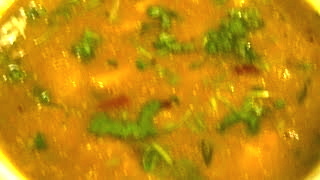 Cook toor dal and keep it aside. Chop cilantro finely. Cilantro stems can also be chopped if you like. Cut garlic into small pieces. Keep a thick bottom vessel on medium heat. Add oil. When the oil is hot add garlic and fry until it is light brown. Take them out and add ghee to the same oil. 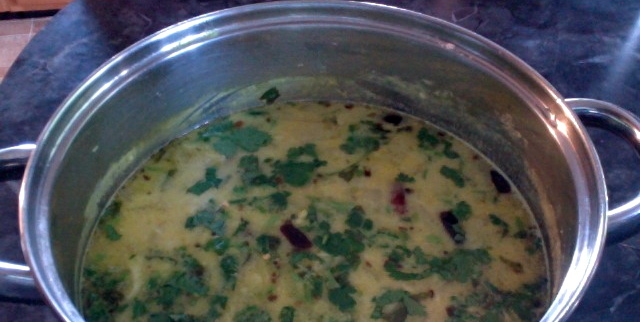 Add fenugreek seeds followed by mustard and cumin seeds. Keep stirring. When the mustard seeds are spluttering add red chili by cutting into pieces. Add hing/asafoetida and curry leaves. Add cooked dal to this tempering. Add some water also otherwise it sticks to the bottom. 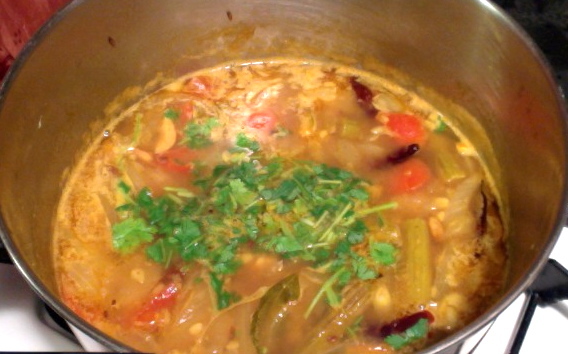 Squeeze out the juice from tamarind and add it to the dal. Add more water and repeat until you get all the juice from tamarind. Add salt, turmeric powder and stevia or jaggery. Add more water for your desired consistency. And adjust all the tastes like salt, tamarind and jaggery according to your own taste buds. Add cilantro stems and let it boil for at least 10 minutes on low flame. Then add cilantro and turn off the stove. 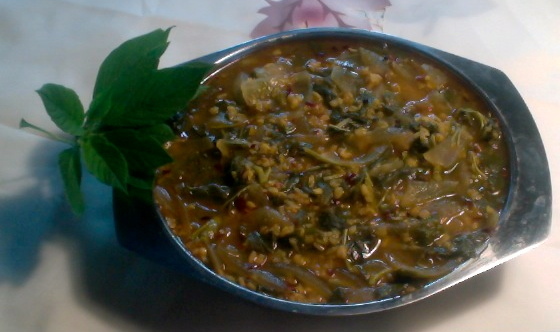 Enjoy this pappu charu/pappu pulusu with whole grain brown rice. 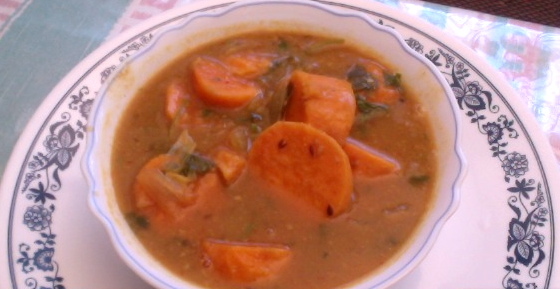 Make potato curry or potato fry/vepudu along with pappu charu/pappu pulusu which will be a good combination. 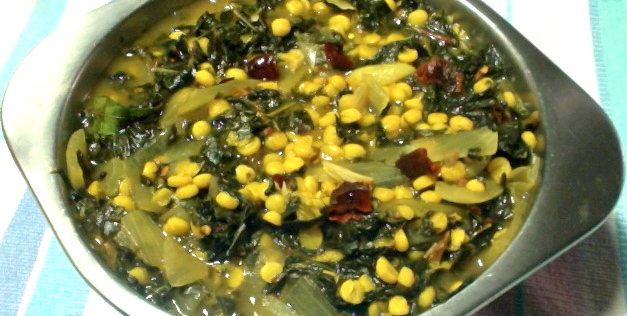 Toor dal is a good source of protein and fiber. Do not use sugar in place of jaggery or stevia. Stevia is a natural sugar substitute and it is many times sweeter than sugar. It is a good alternative for sugar. It is good for people with diabetes and people who is watching calories.